Most of indicators have lag and response by delay. They are usually showing trend change late. 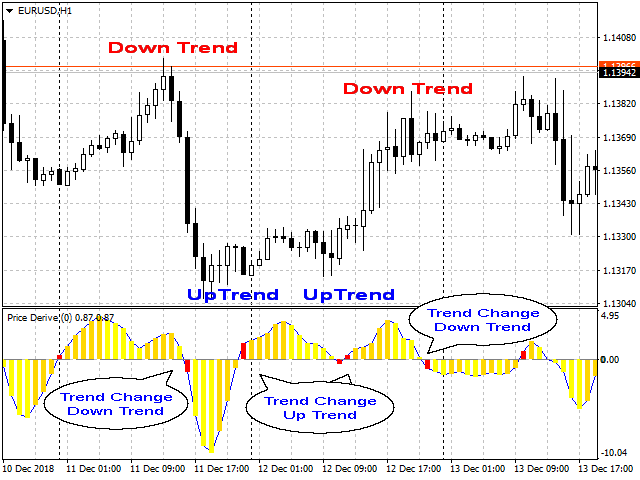 Price Derivative indicator is a powerful and sensitive tool to find each trend direction change and its power. It derives price values based on two Double EMA (DEMA) curves. 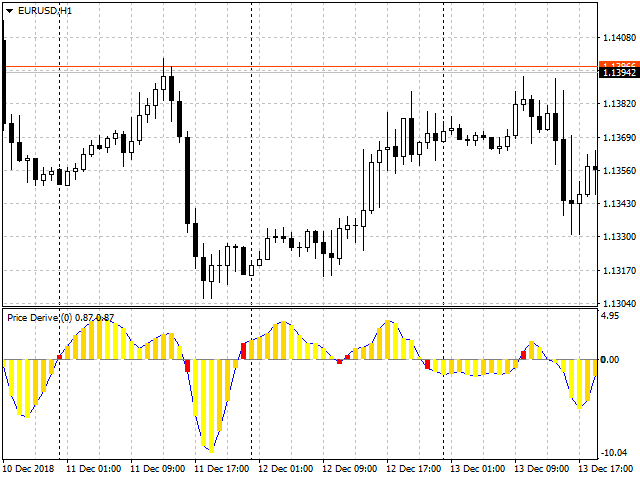 Each time the direction of trend changes, indicator crosses the horizontal axis and a red bar appears. Red bar is a trigger and confirms beginning of a new trend. Positive values indicate up trends and negative values indicate down trends. Scalping with Price Derivative indicator is very simple and accurate. Bars have two almost similar yellowish colors. The darker one means greater derivative rather than previous bar. Therefore, in uptrend, which indicator bars are above horizontal axis, darker bars follow each other until inflection point, which price curve concavity changes. After inflection point, trend speed reduces and lighter bars appear. It continues to cross zero line; means new trend begins and triggers the red bar. No matter what timeframe you choose, it works at M5 as well as H1 or H12. There are just two parameters; Applied Price which its default value is PRICE_CLOSE and Curve Roughness factor ALPHA. 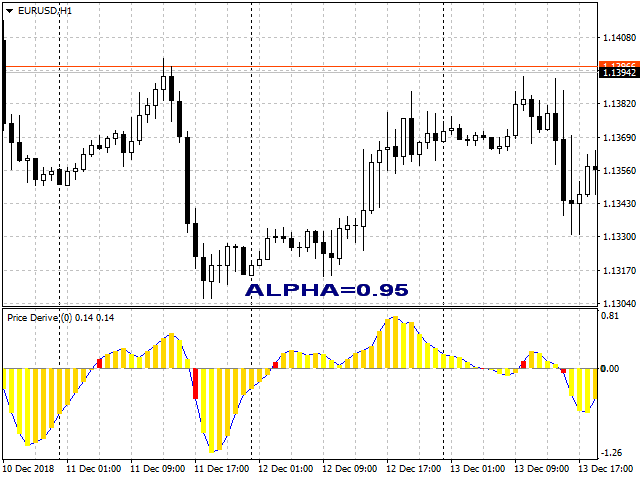 Lower values of alpha, soften indicator curve. It could be useful in high volatile conditions. Lower alpha ignores rapid ripples and shows a steady curve. Complete modification. Apologize for incorrect function of previous versions. Just delete the second DESCRIPTION line!